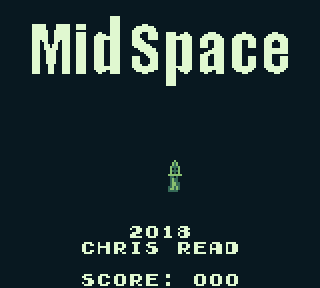 midspace: a game for your Game Boy. you control a rocket going through space. All of a sudden you spy a bunch of aliens. You caught them a little too late as they put you in a force field where you can only move left and right for a limited length. These aliens are coming by the hundreds in four different types of UFOs. And you'd better shoot them fast, because if the UFOs get into your force field, your ship will explode and the game will end! for more game notes, i have made a crude manual for downloading and reading.